Laser therapy has been proven successful in the treatment of many conditions including sports injuries, neck and back pain, and peripheral neuropathy. Known for its therapeutic effects of managing pain and inflammation, laser therapy can be used to treat many conditions you wouldn’t expect, such as bumps and bruises, cuts and scrapes, minor wounds, sprains and strains, migraine, tension, and sinus headaches, and ear, tooth, and jaw pain. 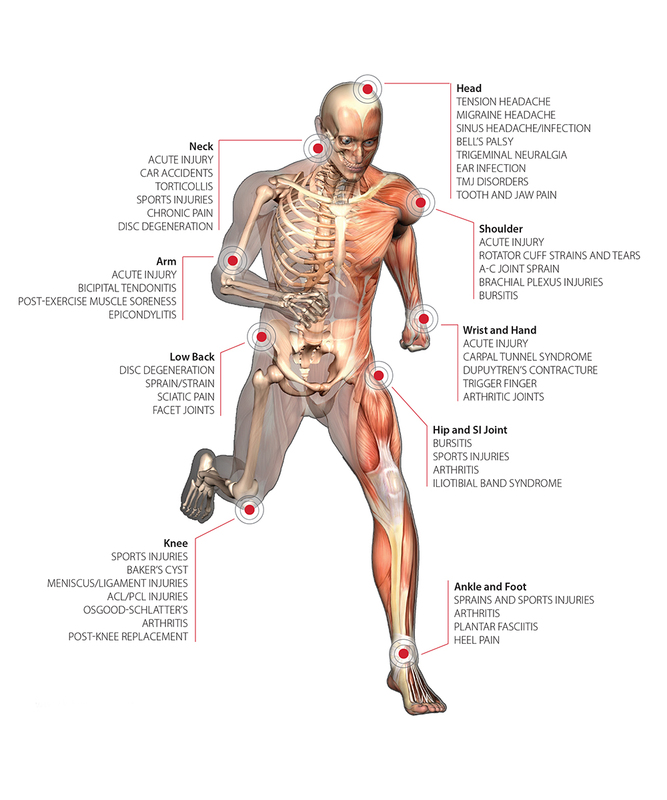 Explore the “Running Man” chart below to discover the many ways laser therapy can help you live a healthy, pain-free life. Injuries can occur to anyone at any age and can affect various parts of the body. There are typically two types of injuries: macro trauma and micro trauma. Macro trauma is a situation where the injured individual can point to a specific incident. For example, an auto accident, a sports related injury, or a slip and fall can all result in damage to the body. Some common macro trauma injuries include: neck and back pain, muscle and ligament sprains and strains, bone fractures, and joint damage to various areas such as the ankle, knee, and/or shoulder. Micro trauma is a little different and is often associated with repetitive strain, overuse injuries, and/or poor posture. Some micro trauma injuries include arthritis, carpal tunnel syndrome, chronic neck and back pain, and tendinitis. See below for more information regarding some common conditions.